Create a photo booth utilizing the gear you already own. 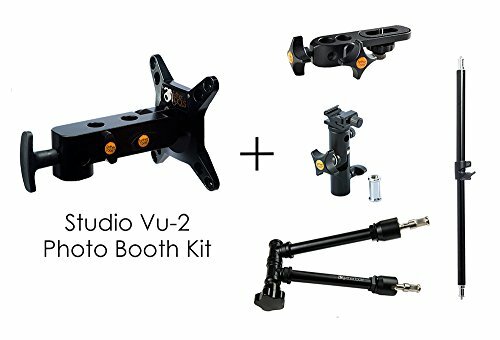 With this kit you can mount a monitor and camera to a C-stand or lightstand, utilizing the standard 5/8″ (16mm) baby stud. This is the perfect photo booth kit for events, weddings or parties. Listing is for included parts only. Stand, Camera, Monitor and other accessories sold separtely. Connect any VESA compliant 75x75 or 100x100 Monitor (adapter plates available for larger monitors). Monitor can easily rotate from landscape to portrait position. Does not include a tripod, stand, monitor, camera or photobooth software. If you have any questions about this product by Tether Tools, contact us by completing and submitting the form below. If you are looking for a specif part number, please include it with your message.